TheraTogs Wunzi Infant System was inspired by the familiar ‘onesie’ for infants. Wunzi is designed for babies up to 26 lbs. and provides a customizable body hug that improves trunk alignment and stabilizes the core. Babies build trunk and neck control/strength before they gain functional skills. Trunk control problems that occur in infancy typically lead to long-term developmental deficits in limb use and movement. The Wunzi system is designed to help very young clients by increasing sensory input while improving core stability. One of our most popular products, it supports therapy goals both during and between therapy sessions, providing essential carry-over. The base system includes limb cuffs and strapping to create optimal posture, and the add-on Limb Kit operates like external muscles and ligaments to improve functioning body and proximal joint alignment for better motor development. Caregivers love the over-the-diaper design which is quick and easy to put on. Closure tabs are embedded right into the garment – no loose tabs to keep track of. Like all TheraTogs systems, the Wunzi is a comfortable, foam-lined, Velcro®-sensitive garment and strapping system that grips the skin. The patented composite fabric is elasticized with a stretch bias that favors good postural alignment – excellent for a growing baby. If you don’t see your indication in this list talk to your clinician or call us to see if the Wunzi might be right for you. Hadders-Algra M, Brogren E, Katz-Salamon M, Forssberg H. Periventricular leukomalacia and preterm birth have different detrimental effects on postural adjustments. Brain 1999;122(Pt 4):727– 40. Dargassies SA. Neurological Development in the Full-Term and Prema- ture Neonate. Amsterdam: Excerpta Medica; 1977. Casear PJM. 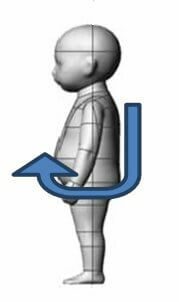 Postural Behavior in Newborn Infants. London: [Published for] Spastics International Medical Publications [by] William Heinemann Medical Books. 1979. Gesell A. Gesell and Amatruda’s Developmental Diagnosis; the Evaluation and Management of Normal and Abnormal Neuropsychologic Development in Infancy and Early Childhood. Hagerstown, Md: Medical Department, Harper & Row; 1975. Brazelton TB. Neonatal Behavioral Assessment Scale. London: Mac Keith Press: Distributed by Cambridge University Press; 1995. For Torso Length measurement (expressed in inches), measure down from C-7 (the big bone at the bottom of the neck) over the diaper and up to the child’s navel as shown below. Be careful to wrap the tape gently over the diaper. For Belly Girth, measure the infant’s belly circumference at the navel (also in inches). To address gait or lower extremity alignment issues Smaller sizes of the Full Body System or the Lower Extremity System.